As an Albany NY wedding photographer, I regularly travel into other areas. I consider a wide circle around Albany NY to be part of my home base as an Albany NY wedding photographer. Lily and Nate had a fine first look and this became a favorite first look photo at their rainy day wedding in the Berkshires of Mass. Rain on the wedding day simply takes an attitude adjustment. You might get wet, there might be a change in plans for footwear, umbrellas might be needed. But rainy wedding days often produce some great atmospheric wedding images. As long as you are willing to be a little adventurous, as an wedding photographer Albany NY I can take advantage of the soft light, the beautiful colors and the general gentle mood the weather can bring to a wedding day...A bride and groom enjoy their first look on their rainy wedding day. Weather on the wedding day is a matter of perspective and attitude. As a wedding photojournalist you can ask me to see my rainy wedding day photos from the many past weddings I have photographed in bad weather. The first look at a wedding is a great opportunity for the bride and groom to have an intimate moment together as they see each other for the first time. The first look lessens the rushing and stress. Also, it allows for you to do formal photos before the ceremony which will free up time for you to enjoy the while cocktail hour without having to run off and take photos as many of those photos will be done earlier in the day...Another advantage of a first look for a bride and groom at their wedding is that all of your clothes, makeup and hair will be at their freshest. Everything will look its best for your New York wedding photos. Planning for a rainy wedding day is easy. It starts with a great attitude. The wedding day ruined because of rain? Hardly. Sure there will be challenges when people move from location to location but those can easily be solved by having lots of big umbrellas for everyone. Colorful umbrellas for the wedding day should be purchased if the forecast calls for rain on the wedding day. Avoid highly patterned wedding umbrellas as they will be distracting in the photos. Colorful or big blocks of colors are good for wedding photos...One of the benefits of an overcast cloudy or even rainy wedding day is that the light is very soft and even. 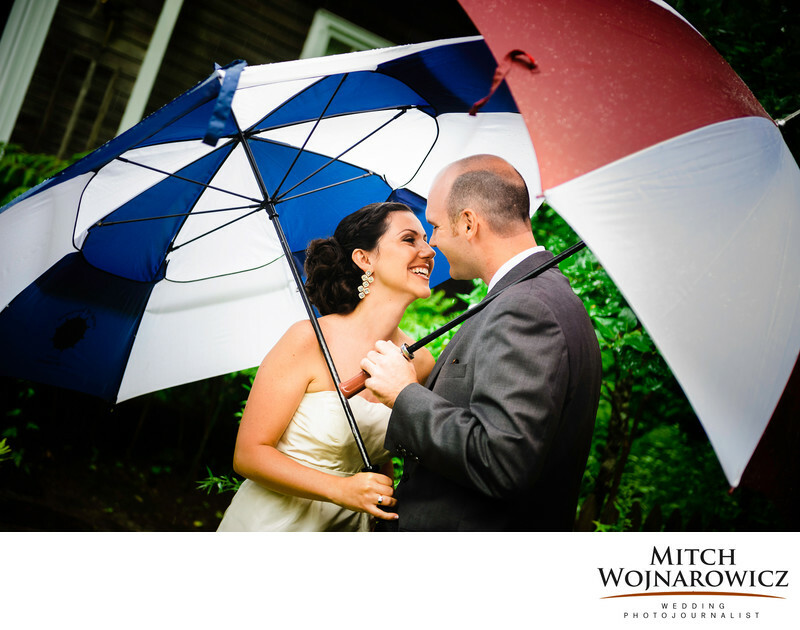 Bad weather wedding days make for great photography!..If you’re interested in an affordable wedding photographer, take a trip over to my website to see what Mitch Wojnarowicz Wedding Photographer offers. My nontraditional wedding photography appeals to a large section of the wedding market where people are looking for natural wedding photography and images from their wedding that are authentically and uniquely theirs. You don’t want images from a wedding photo checklist, though an Albany NY wedding photojournalist such as myself will cover all of those moments that you’d expect covered at a wedding.